Plumbing giant A.J. Perri has been hit with a $100,000 fine – the largest ever levied by New Jersey’s plumbing board – and has agreed to reform its deceitful business practices under a consent order reached with the state Attorney General’s Office. The deal, finalized last week, follows a Bamboozled investigation that found the company routinely performed expensive work that wasn’t needed, incentivized employees to upsell jobs and used scare tactics on customers, including bogus claims that their equipment could explode at any time. Bamboozled spoke to dozens of customers, along with current and former A.J. Perri employees, who painted a portrait of predatory practices fueled by a commission-based sales structure and pressure to meet sales goals. In the investigation’s wake, the state’s Board of Master Plumbers opened its own inquiry, ultimately receiving complaints from 30 people, some of whom were profiled in the Bamboozled investigation. According to the consent order between the board and Michael Perri, a minority owner and A.J. Perri’s licensed master plumber, the company “repeatedly engaged in use of deception and misrepresentation” in violation of the state’s Uniform Enforcement Act. A.J. Perri also failed to maintain video footage of jobs and document their findings, a violation of state plumbing license regulations, the order said. The company, which admits no wrongdoing under the settlement, agreed to pay $75,000 immediately. The remaining $25,000 of the fine will be stayed pending A.J. Perri’s compliance with the terms of the agreement. The agreement also spells out specific protections for future customers of the company. The full text of Kevin Perri’s statement to Bamboozled. “This settlement not only imposes a record civil penalty befitting A.J. Perri’s egregious misconduct, it requires the company to make substantive changes in its oversight and management of technicians to ensure that consumers receive transparency and honesty from A.J. Perri, as required by law,” Porrino said. 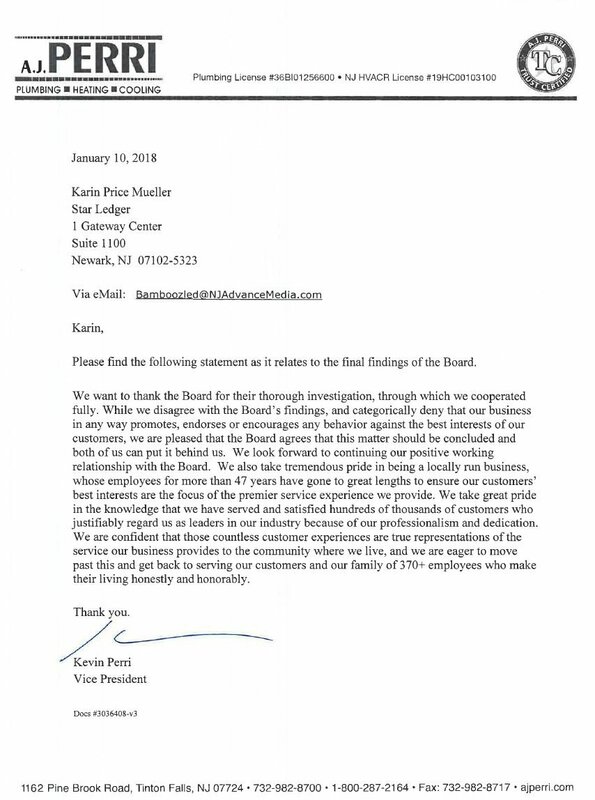 “While we disagree with the Board’s findings, and categorically deny that our business in any way promotes, endorses or encourages any behavior against the best interest of our customers, we are pleased that the Board agrees that this matter should be concluded and both of us can put it behind us,” Perri said in a written statement to Bamboozled. You can read the full consent order here. The case began when Bamboozled was tipped off by an A.J. Perri employee. The employee, who shared internal emails and photos, alleged the company sold an $11,500 sewer line to Karl Baer, 86, when only a spot repair was needed. The story unleashed dozens of consumer complaints to Bamboozled, including one from the family of an 85-year-old man who suffers from Alzheimer’s disease. The family said it asked A.J. Perri to stop contacting their father, but calls continued, and the dad agreed to an $8,000 job that his son said was unneeded. 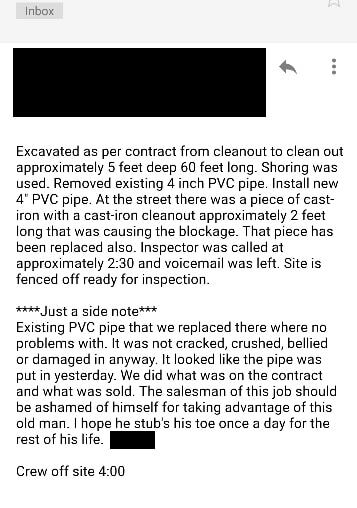 Another consumer said her grandparents, in their 90s, were scared into agreeing to an $18,000 job that required ripping up their basement floor and digging two feet down and 35 feet across to replace a supposedly crushed cast iron pipe. Family members questioned why the company replaced the whole pipe rather than only replace a section where a blockage was found. Others reported they were told their heating equipment was giving off hazardous carbon monoxide, which second opinions showed was not true. An internal email about Karl Baer’s pipe replacement, provided to Bamboozled by an A.J. Perri employee. Internal emails were also provided to Bamboozled by current and former employees. One showed a contest for “sales leads,” while another told employees to pay special attention to routine service calls, the goal of which was “to find as much as possible wrong with the heating or cooling system that the tech gets a heating and cooling salesman in the home to price out a new system,” the employee said. The plumbing board opened its review, inviting those consumers and others to testify before the board. When the board asked company representatives about specific consumer complaints, it learned video of the sewer and water lines of multiple customers had been recorded over and was not available for the state to examine, nor were there photos to substantiate the recommended work. In other cases, work was recommended by commissioned camera technicians who were not licensed master plumbers, and the company had no notes to confirm whether the recommendations or videos were reviewed by a licensed master plumber. Attorney General Porrino said at the Board’s behest, prior to the settlement, A.J. Perri provided full or partial restitution to affected consumers. In all, 24 of the customers who complained to the state received full or partial refunds, the consent order said. The others had not given any money to A.J. Perri. Beyond the fine and reprimand, the agreement offers important consumer protections for future A.J. Perri customers. All camera inspections of sewer or water lines will be kept for four years and made available to the state if a complaint comes in. A. J. Perri will have to supply written options for recommended work, rather than only verbal ones, and consumers will have to sign the form. Any work recommended by a Perri employee who is not a licensed master plumber will have to be approved by a licensed master plumber before any work can begin. The licensed master plumber’s recommendation must also be in writing. If the state receives future complaints, the company agrees to respond in writing within 30 days to both the consumer and to the state. The consent order spells out in detail how the complaints should be handled, including binding arbitration with the Division of Consumer Affairs if the consumer is unsatisfied with the company’s response. Plus, future violations related to senior citizens will result in fines of $10,000 each. Consumers who complained about their experiences welcomed news of the consent order. Karl Baer stands on his property, which was dug up by A.J. Perri to replace a sewer line. Baer said it’s ironic that he continues to get calls from the company, for example, offering service for his furnace. “I want nothing to do with them,” he said. Avital Spiegel, the daughter of the Alzheimer’s patient, called it a win but said it’s not enough. “To think that someone was willing and able to take advantage of him due to his age is nothing short of a criminal offense,” she said. Richard Gomulka, who claimed A.J. Perri told him his boiler was releasing dangerous levels of carbon monoxide, praised the agreement.